This morning I read an article in the New York Times entitled "He Cooks. She Stews. It’s Love." that rung very true to me. It's about the recent phenomenon of 'alpha cooks'. I'm always endlessly fascinated with human psychology and the different ways that the genders interact with each other. The article talks about women in the kitchen who have become intimidated to cook by their alpha cook husbands. It's an interesting topic given that traditionally (in a lot of cultures), the role of the cook has fallen to the woman of the house. Seems like now with the advent of people developing gourmet tastes and learning all kinds of culinary skills from FoodTV, even men are into cooking. The cooking is usually done by the women in both my husband's family and mine but the interesting thing is despite their resemblance to certain male stereotypes all the men are incredible cooks. My father, my father-in-law, my husband, his brothers, and his uncles all cook very well, and of course demand good food to be served to them. I think they learned to cook from eating the amazing food our grandmothers would prepare, and they learned from seeing food preparation around them and hearing people talk about it. I think it ultimately comes down to their highly developed palates for Indian food. When one eligible suitor came to visit me for the first time, I cooked some dishes to 'impress' him and try to show of my Indian bride-to-be skills. I made chole, mattar paneer, and rasamalai. I think the chole and rasamalai turned out pretty well, and the mattar paneer - lets just say I was on a health kick and decided that baking the paneer would be a good idea. Little did I know you are supposed to soak that in water afterwards, or some such technique, so it doesn't get rubbery. I still haven't lived that down. After getting married (yes, he still proposed to me after eating the baked paneer) I was so scared to enter the kitchen, because my husband has a reputation in his family for being an amazing cook. He IS a great cook, so is my brother in law, and my sister in law is too. Don't even ask about my mother in law and their aunts, or my mother and my aunts. This was too much for me, little Kanch from Canada who never grew up in India, who couldn't possibly be expected to make a decent sambar let alone a full South Indian meal. Yes my friends, against the cultural expectations of a new Indian bride my husband would make me rasam sadham and bring it to me in a bowl. What service! Those were the days (lowered expectations really pay off!). So anyhow after all of these humiliations and failings at cooking (there were many more such baking paneer experiments gone awry) I found my secret weapon. A 3 week cooking boot camp from my mother-in-law. And now my husband cannot complain as the recipes are just the way his mother makes them, and boy has being unemployed allowed me to practice a lot! Now I can whip up sambar and rasam like the rest of them. Having an alpha cook husband has actually been a real asset to me. In the beginning I would take serious offense to any 'criticism' of my skills (yes, i would go off and have a little cry every now and then). Now that I have accepted my role as student I really try to learn a lot from those who have some skills. And having a husband who can tell me what can be improved in a dish is a plus in developing great recipes and technique. Especially when I have never even eaten some of these dishes before! Check out the NY Times article if you can. I really feel that learning to cook has given me a lot of confidence, and it is a great life skill. One of the greatest in fact. The confidence is probably more from my husband regularly asking me to prepare meals for him and requesting items too. Here's to cooking a nice meal for your alpha mate on Valentines Day, Cheers! ps. 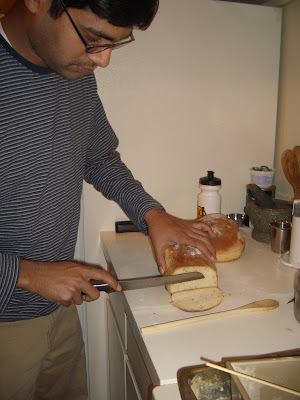 Yes my husband is cutting bread he made himself, from scratch. cute pics, especially the HRM one! When i first started cooking.. i ask my mom to tell a recipe and then to make sure i understood correctly, she will ask me to repeat, next sec reply will be when you say itself it is clear that u go not know "abc.." of cooking. Growing up in chennai i had luxury mom or aunt cook for you. I started to watch food network, what the hell they show only how to cook meat, but some of the shows really inspired me one of them is "Good Eats" by Alton Brown, he does not only explain just cooking adding salt and pepper, rather the science behind cooking. For example when you cook spinach if you close with lid it will oxides and the color will change,instead if you keep it open you will retain that green color that will be good when you make palak paneer.